Unfortunately we have some bad news today: We’re having to shut down our merchandise store due to uncertainties surrounding the UK’s exit from the European Union. 80% off all physical only products – That makes £2.39 for shirts and posters, £5.59 for boxed copies of the game and £0.55 for Soundtracks! 70% off the boxed complete edition (Game + Soundtrack) which includes instant access steam keys for the game and its expansions emailed directly to you! No need to wait for the box. Up to 75% off other digital codes, it’s the perfect opportunity to complete your collection. Those are some pretty insane discounts and we’re definitely not making a profit on this! If you’ve placed an order from the store recently and feel like you missed out on this blatant disregard for capitalism, we’d be happy to offer you an additional discount simply contact us with your original order number via email to [email protected]. Anyway. We wish we didn’t have to do this – hell, we wish this country wasn’t (currently) set on leaving the EU – but unfortunately, we must. If it’s feasible to re-open the store at a later date, we will, but at this time we aren’t able to make any promises. So don’t miss out and head on over to the store and grab some memorabilia while you can! Q: Why are you shutting the store down? A: Without the certainty of outlook as to what the UK’s relationship with the EU will be on the 29th of March we cannot anticipate the requirements this store will place on us. We have decided it is best to shut down the store until such a time where we are certain of our obligations. We hope to get as much of our stock into the hands of our true fans before the exit date via this sale. A: The Brightrock Store is currently a very minor part of our business and is almost entirely independent from all our other activities. There will not be any disruption caused by shutting the store down. For the most part the store has always been about getting our existing Merchandise out to our loyal fanbase and not primarily a money-making endeavour. Everything else will remain on track! Q: Is there anywhere else I can purchase War for the Overworld merchandise or digital codes? 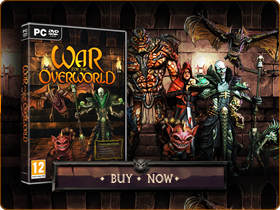 A: Unfortunately we are the only sellers of official War for the Overworld merchandise. If you wish to get your hands on some awesome swag then to avoid disappointment we recommend you grab it now while it’s deeply discounted! War for the Overworld and its DLC will continue to be sold digitally at all our partners and via the Humble Widgets on wftogame.com provided there are no further unforeseen disruptions. Q: When does the store close? What is the last order date? A: The store will close at 17:30 GMT on Tuesday the 5th of March, you may still be able to access the pages after this time but you will not be able to place an order. You can place an order at any point up to this time but we advise you order soon as our stocks are strictly limited. A: We will be shipping all orders beginning the week starting the 4th of March and will aim to ensure all orders are shipped by the end of the 6th of March. No orders will be dispatched prior to the 4th of March due to staff leave. Q: I placed an order on some physical merch from you recently and I feel short-changed. A: We understand your frustration and as always we believe in trying to do the best we can by our customers. We had not planned for this sale to take place but are simply reacting to the current political climate. In respect to our valued fans and customers, we’re prepared to offer an even deeper discount if you placed an order which included a physical product in the last four months. Email us at [email protected] with your previous order number and we’ll get back to you! A: This should not affect our presence on any of our partner’s stores. You should still be able to purchase War for the Overworld and its DLC from them. Q: With your official store shutting down how can I best support your development efforts? 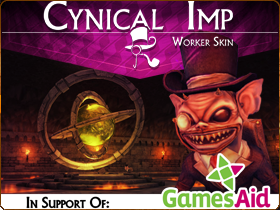 A: You can support us by following our social media accounts (WFTOGame, Brightrock Games), signing up to our newsletter (Sign-up in game to get a free worker skin!) and playing the game! If you want to purchase the game or wish to recommend it to a friend then purchasing it via the Humble Widgets on wftogame.com is preferred. Q: Will you be reopening the store or selling digital codes and physical merchandise in the future by some other means? A: We have enjoyed the adventure of running our own storefront exclusively for our own products. We are always keen to continue exploring avenues and would love to discover ways to bring our worlds to life in the hands of our fans. Although it’s certainly never going to be our primary business, that will always remain making awesome games, we will certainly keep our eyes open. If all goes well the store may well re-open. But for now we can’t commit until the dust has settled. Q: Why not keep the store open for UK customers? A: Although or ability to service UK customers should not be affected by the outcome of the coming weeks, a large percentage of the business the store receives is international. As it stands the overheads of operating the store is simply too high for the UK alone to support. Sadly this means we cannot continue to operate the store solely for UK customers.